Real Madrid had the perfect night once again in the UEFA Champions League after winning a 13th crown overall and a third successive honour. Zinedine Zidane’s men beat Liverpool 3-1 on the night thanks to a Gareth Bale brace. The Spanish giants continued to dominate under the French boss, who won his third successive title as a manager. Bale was the hero of the night with an acrobatic bicycle kick from a Marcelo cross in the 64th minute. He followed it up with fierce strike that saw Loris Karius make another costly mistake. Cristiano Ronaldo also had his chances, but was denied beautifully by Andrew Robertson. But the Portuguese still became the first player to win a fifth Champions League winners’ medal. It was his fourth with Real. Despite all the celebrations in Kiev, two striking points came by, which have got many fans wondering on the future of these two superstars at Real. Sky Sports journalist Guillem Balague, pointed out the same, with the players’ post match comments, which raise some serious doubts. Bale stated that despite producing the goods, he was disappointed not to have started the game. He also said that he has been for quite sometime after injury hampered parts of his season. The player has been benched on most occasions in the UCL. He got a rare start against Juve in the 2nd leg of the quarter-finals, but he disappointed on that night. 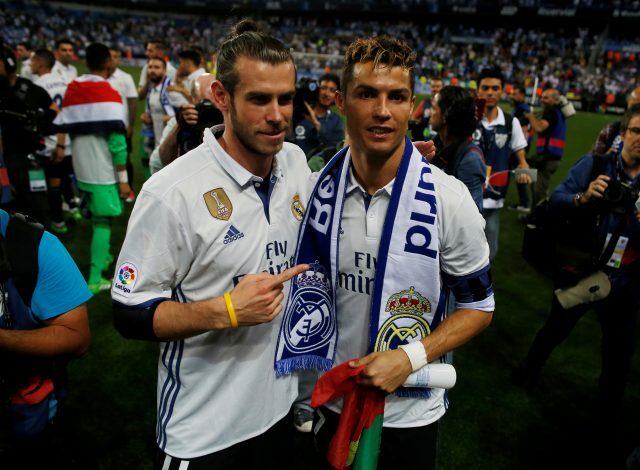 Bale has been in the midst of transfer speculation, with Manchester United interested in the player for a while, and if they come in with a serious bid, one may never know what could happen. As for Ronaldo, the player said that it has been lovely to play for Real, thereby hinting at a potential departure in the near future. He is another player that has lately been linked with a move away from the Spanish capital. But the Portuguese has a contract, and Balague added that Real president Florentino Pérez has stated the same. This, in turn, means they could have a say in any possible deal.